To Inspire Young Men to D.R.E.A.M. -Develop Responsible, Employable & Ambitious Mindsets through the power of the animals, hard work and The Code of the West! Today’s young adults lack drive, a good attitude and solid effort. Our goal is to ignite that fire and get these young men thinking differently about their future. When you think about the American Dream, what comes to mind? Opportunity. Its is the chance to be successful and to prosper through hard work. Achievements only come through determination and perseverance. These young men are the future of America. They are the ones who can help bring this country back to the values it was originally built on. We empower the young men who come to Beartooth Mt Ascent to work hard for the person they aspire to be. At Beartooth Mt Ascent we are committed to helping each young man become the BEST version of himself. Our family ranch is at the heart of western culture: it is a place where we inherit the timeless values that challenge and shape our daily lives. At Beartooth Mt Ascent Family Ranch, we are proud of our western heritage and seek to pass on this great American tradition by offering young men a chance to become true cowboys. 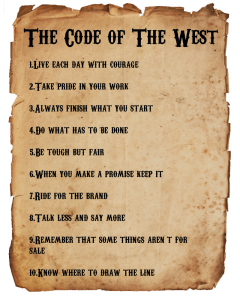 We believe that our western way of life will enable young men to internalize the cowboy “Code of the West,” and that this experience will transform him into a man of integrity and purpose. Each young man that participates in our ranch life will be responsible for the care the livestock including horses. Through this western cowboy way of life young men learn to work hard, stick to things even when it gets tough, and to finish what they start. When the cattle are set to pasture during the summer months, the young men will periodically cover our 40,000 acre range on horseback to monitor the entire herd, making sure there is sufficient water, the fences are maintained, and that there is not extensive loss of cattle to predators (bears and wolves.) Each young man will also contribute to the production of cattle feed by farming crops during the spring and summer months, when he will learn several valuable skills such as equipment maintenance, crop irrigation, and welding. The agricultural way of life will help your son simplify his needs and will teach him how to order them around his responsibilities, his faith, and his friendships with others at Beartooth Mt Ascent Family Ranch. By “riding for the brand,” your son will gradually heal and begin to understand the importance of practicing an obedience to God in his relationships. We believe that our program will teach him this invaluable lesson and help him accept the expectations his parents have on him as a son, and his siblings have on him as a brother. Contact Beartooth Mt Ascent Family Ranch for help with your struggling son. Call us TODAY at (307) 645-3381.